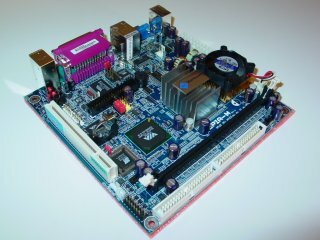 With people wanting smaller and smaller computers for obscure applications (such as dedicated TV/DivX boxes or Internet Gateways etc) there was a need for a small form factor fully integrated mainboard. 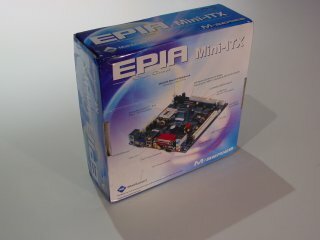 Last year VIA introduced one of the smallest commercially available motherboards, but unfortunately they (the EPIA-5000 and EPIA-8000) were not powerful enough for peoples needs, knowing this VIA put more research and design into their new model the EPIA-M 9000 which addresses most of the issues of the previous board as well as sticking to the low form factor Mini-ITX design. 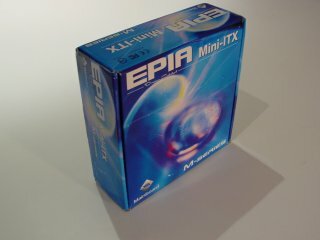 In this review we get to test the new VIA EPIA-M and see just how powerful it is so that we can compare it to its predecessor the EPIA-800 and more common personal computers. "The Mini-ITX mainboard form factor is the world's smallest native x86 mainboard measuring only 170mm x 170mm and enables the development of an infinite variety of small form factor system platforms. More than 33% smaller than the FlexATX mainboard form factor, the Mini-ITX allows for the development of entry-level value PCs, Thin-Clients, wireless network devices, digital media systems, set-top boxes and more. 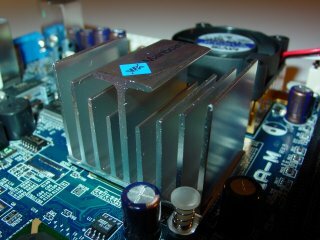 With the I/O ports as the tallest components on the board (including the CPU cooler), the Mini-ITX mainboard is also becoming increasingly popular among the rapidly emerging enthusiast user group, seeing the small size, quiet operation and low profile as ideal for moving the PC to different parts of the home from stylish case modifications for the living room to in-car PCs. The VIA EPIA M-Series Mini-ITX Mainboard is a revolutionary, ultra-compact x86 platform optimized for today's killer digital applications. At just 17cm x 17cm, Mini-ITX is the world's smallest native x86 mainboard platform, and is fully compatible with Microsoft� and Linux Operating Systems. Available with an embedded VIA Eden?� ESP processor core for fanless systems with ultra low-power requirements, or an embedded VIA C3� E-Series processor for more demanding digital multimedia applications, the EPIA M-Series is the perfect platform for a whole range of small form factor, low-power digital media devices and home entertainment centers. The EPIA M-Series' VIA Apollo CLE266 chipset features an embedded MPEG-2 decoder for silky smooth DVD playback, and integrated 2D/3D graphics for a rich multimedia experience. With the sizable memory bandwidth of DDR266 SDRAM and the high data transfer speeds of ATA/133, the EPIA M-Series ensures the high performance levels required of today's most popular digital media applications. The user's digital media experience is further enhanced by support for 5.1 surround sound, courtesy of the onboard VIA VT1616 6 Channel AC'97 codec. 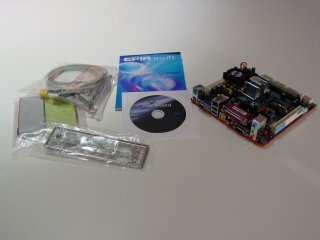 The EPIA-M Mini-ITX package comes with just about everything you need (bar of course memory, hard drive, dvd/cd-rom and a case :P). Below you can see more detailed pictures of the mainboard itself. Although the Mini-ITX form factor is quite small, VIA managed to package many useful features into the design as well as giving room for expandability. 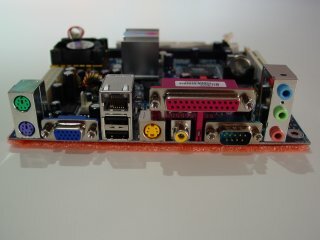 As you can see from the above picture of the back of the mainboard, pretty much all the connections are catered for, the only connections not provided here are the 2 x USB 2.0 and 2 x IEEE1394 Firewire ports which are provided on the PCI bracket which plugs into headers on the mainboard. 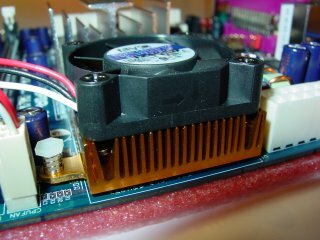 The CPU uses a heatsink and fan that you would see commonly on today's ATX northbridge's. The heatsink on the EPIA-M is the same that was on the original EPIA, a gold anodized low profile heatsink with a low noise fan running at 6200RPM which pushes around 7.9 cubic feet of air a minute, producing about 29dB. VIA changed the CPU to the C3 E-Series processor running at 933 MHz, from the C3 running at 800 MHz on the original EPIA, the new C3-E CPU puts out less heat than the previous C3 on the EPIA. This new C3-E processor is made on a 0.13 micron process and has the worlds smallest x86 processor die size of 52mm^2. It has 128kb of integrated Level 1 and 64kb of level 2 cache running at full speed. As on the EPIA, the CPU is in a EBGA (Enhances Ball Grid Array) package, which means it is directly attached to the motherboard. This means that the CPU cannot be upgraded in the future. The EPIA-M uses a VIA CLE266 northbridge chipset, which allows a FSB (front side bus) of 66, 100 or 133 MHz. The CLE-266 has a built in graphics chipset which provides the system with MPEG-2 (DVD) decoding, this is on an internal 8x AGP bus. The new chipset also allows for DDR-SDRAM support (giving the system a bit more memory performance over the previous EPIA which only supported SDRAM). The southbridge of the EPIA-M uses the VT8235 chipset allowing for up to 6 USB 2.0 ports (although only a max of 4 on the EPIA-M), ATA-133 support, 6-Channel AC-97 and a VIA 10/100 Ethernet Adapter. Through the BIOS of the EPIA-M the three 3.5mm audio jacks can be set from LINE IN, LINE OUT, MIC IN to FRONT OUT, REAR OUT and SUB-WOOFER OUT allowing a surround sound output, which is idea for movie playback. VIA also decided to upgrade the TV-Out chipset to the VT1622M as opposed to the previous VT1621, as a result the TV output capabilities have been increased to support 1024x768 in both NTSC and PAL formats. 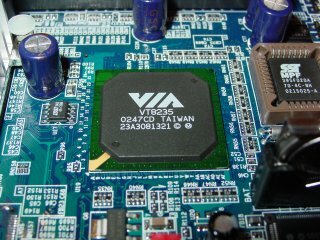 The "M" on the end of the chipset name stands for Macrovision, which means that output to DVD's, VHS or other formats is not possible, this doesn't not however affect the standard viewing on a TV set. Another big change is the addition of a floppy drive connector to the EPIA-M which the previous EPIA didn't have. Since alot of people didn't like the lack of a floppy drive connector, VIA decided to incorporate one into this new model. For those people like me who don't use a floppy drive, it doesn't cause us any problems. 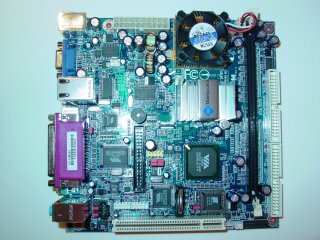 The following system was built using the supplied EPIA-M mainboard in order to perform the necessary tests. Although the PSU and Memory were a bit of an overkill the extra power they could handle was not used during testing and thus should have had no effect on the overall results of this review. 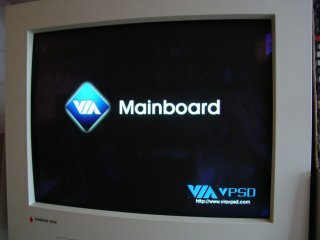 Above is a picture of the BIOS pre-boot screen, looks classy if you ask me. DivX: A number of different tests were run on DivX, firstly playing a file from the local hard disk, seconds across the 100mbit network from the file server. Both methods were fine and even on the highest quality DivX files (thus the largest movies roughly 2GB in size) the system didn't show any sign of problems. Also when entering and exiting fullscreen mode there where no problems. DVD: Two DVD titles were selected for playback to see how the unit faired. The first title was "A Knight's Tale" and the second "Finally Fantasy", both movies played back in fullscreen without any problems, pauses or screen corruption's at all. The only noticeable slow down that the system suffered seemed to be when exiting full screen mode, the video card took a second or so to refresh the screen and display the Desktop in the background. TV-Out: With a TV connected to the RCA output of the EPIA-M all that was needed to do in order to get the TV out functionality working flawless was to se, both in BIOS and windows, the TV output format to be PAL (as it defaulted to NTSC). DVD's and files from the Hard Disk (such as DivX and MPEG) were played back perfectly on the TV. One really good thing about the settings that the VIA supplied drivers give you is that when you enable TV output (in the Control Panel -> Display Properties -> Advanced -> Output) it also modifies the windows text to display in large text format so that it makes the system easier to use through the TV (this is ideal for those people wanting to use this system solely for a TV box or in-car computer where the only output is an LCD screen running from the RCA output).